Where to find bath towels with marine motifs? The sets of bath linen are found here. To give your home the theme that suits you, here is a set of 600 Gr combed cotton terry collection, embroidered with various themes and original or united. 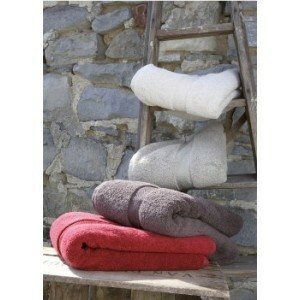 You will also find 450 Gr assorted bathrobes as well as guest towels, bath and shower sheets, bath mats. Here is the collection Les unis. A wide choice of colors and sizes for all those who love bathrooms with colorful atmospheres! 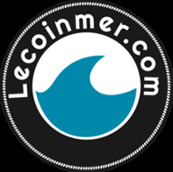 You will find all kinds of sponges such as bathrobes, bath towels, washcloths and much more! 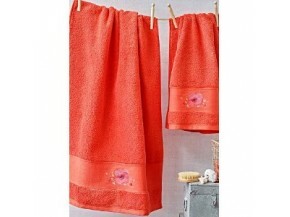 A nice collection of bath linen to dress with quality and elegance the small bathroom of your house by the sea. With a beautiful deep navy blue color, prepare to going offshore and dive in the middle of the seabed with hundreds of shoal of fish. 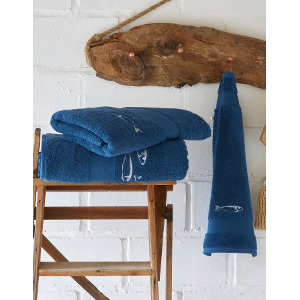 You will find in this collection a large choice of bath towels such as the large bath towel, the shower sheet, the towel, the bathrobe, but also the bath mat and the small practical towel!